I’ve been trying to capture the image of one of these beautiful birds for such a long time, almost as long as my memory serves me. They are quite rare and to catch the fleeting aqua/blue as they fly past is quite extraordinary. 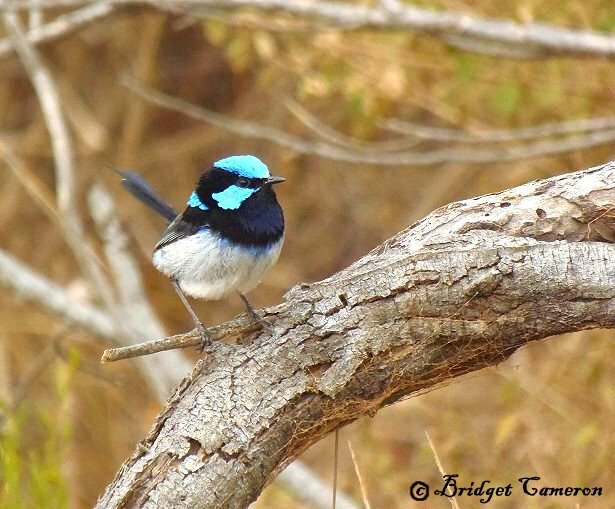 It is only the male fairy wrens that have the bright blue aqua plumage, and only when they are breeding. When they are not breeding, they take on the brown colours of the female wren, although parading a blue/purple tail. Males are usually found with females, as they are socially monogamous. The females brown plumage support a blue tail and they have red feathers around the eyes. AUSTRALIAN RESEARCHERS HAVE DISCOVERED that crafty fairy-wrens can understand and respond to the danger calls of other birds, suggesting that they have an advanced level of awareness about the world around them. For more information about this, please read this article at Australian Geographic. Fairy-wrens eavesdrop to avert danger. p.s. Most images of superb fairy wrens have been enhanced to a more cyan/blue colour, yet their plumage in reality is closer to the photograph that I have taken above. I hope you enjoy his image! I most certainly do… :). Wow! What a great once in a lifetime shot! Beautiful bird. We have lots of wrens here in Virginia, USA ( and I especially Love them), but they don’t wear my favorite color blue! We are kindred spirits! I also occasionally Blog about Nature. Yes, I was most fortunate Carolyn. I am so glad that you have found a kindred spirit in the superb fairy wren! I will check out your blog, cheers Bridget :).